Have you ever found yourself wishing you knew more than just English? Or maybe just thought about helping your child learn some Spanish? I came across a very fun and easy-to-use product line called Boca Beth. Boca is the name of the puppet who teaches kids Spanish and English at the same time in the DVDs. Watch a short clip HERE. Beth is the name of the company’s owner, and she used to teach preschool and elementary school after living in Chile and Mexico. The songs are catchy because most of them are written to the beats of songs we know from our childhood. Listen in to some of them HERE on Boca Beth’s web site now. As a teacher, Beth introduces concepts learned in school such as colors, shapes, days of the week in most of her 52 song line up. Every once in a while your child will sing and dance to a silly song such as Five Little Monkeys (first time many of you will hear that song in Spanish AND English!). Catch some of her 60+ mini lessons over at her YouTube channel with your kiddos soon. Don’t worry – you do NOT have to speak Spanish in order to use Boca Beth's bilingual products. That’s the beauty and simplicity of it all – every song and every DVD clip flows seamlessly from English to Spanish and back again. You will learn right along with Junior! Oh, and U.S. shipping is always free on her web site! Plus, you can save 25% on any purchase at www.bocabeth.com with this special discount code - PLANET - good through 12/24/2013. Check out Twitter fun and Facebook fun with a bilingual twist! Enter to win the Boca Beth Grande Bag! Win this bright backpack full of bilingual fun products. Includes the following: My First Songs in Spanish music CD, More Boca Beth bilingual music CD, Mi casa/My House bilingual educational DVD, I Like Animals DVD, One language learning activity book, One egg shaker, and a How to Guide in English or Spanish. $50 Value! To enter, just fill in the Rafflecopter form below. You must be at least 18 and reside in the US. Giveaway ends on 11/20/2013. Good luck! I learned that her products have won a lot of awards and received a lot of recognition for quality. I would love this for my step daughter. Thank you. All of their gift sets are great deals. I was interested in a cd for the car and a dvd and considering the activity book but if I got them as a gift set it would save me $3 over purchasing separately. I learned that she has spoken Spanish as a second language for 30 years and there are free resources to help us teach the kids. I learned that the products have won many awards. This would be perfect for my kids! I like that they've won awards for this!! The Boca program has three divisions: for kids, parents, and teachers. What a great way to learn langulages! Hola Amiga - We wanted to make certain that even children could visit our web site and play for a while as they learn Spanish right alongside English. Then we made sure to add a section for parents to read about the ways they can help their own child learn Spanish in the car or at home plus help teachers bring this fun music and movement learning into their classrooms since so many of my bilingual songs relate to curriculum based concepts they are already teaching. I learned "Boca Beth is the award-winning and internationally acclaimed language learning program for young children ages birth – eight. - See more at: http://www.bocabeth.com/boca-beth-is-a-bilingual-program-helping-kids-learn-english-and-spanish/boca-beth-makes-learning-spanish-fun-and-easy-with-music/#sthash.Qpc2JPRr.dpuf>"
I like that it combines music with learning Spanish so it seems like play more than lessons. I like the Musical EGG Shaker! I learned that they have three divisions - kids, parents, and teachers. I love introducing spanish to children at a small age. Awesome giveaway. Would love to use with my own children and the kids in my 3yr old class ! Those little egg shakers are lead free and toy tested and so cute!!!! My 3 y.o. has just gotten excited about learning Spanish, and I would love to keep the momentum going! Good to know I can learn along with my kids! It's great offering the free online resources for parents and teachers to bring the Spanish and English learning to little children. Glad you like that idea of free stuff! I love the Musical Egg Shakers! great for spanish...i can learn too! I like the Boca Beth Beginner Backpack. My husband is a native spanish speaker and we would love for our daughter to eventually be bilingual. I really like the idea of the parallel method. I like the Boca Beth Bilingual Language Learning Color/Activity Book because my son would love it. I like that no second language experience is needed. I would love to give some of these wonderful sets to my god-daughter (and her brother and sister - my nephews kids!) They are all very talented: artistic and musical - just like their parents! All of us believe that it is very important (and personally enriching) to be bi-lingual - if not multi-lingual - and the earlier they start learning the better. Thanks. Thoughtful prize - thanks! I learned that they have won awards. I learned that they teach to the whole child using the TPR method (Total Physical Response)! I really like My First Songs in Spanish, a great way to learn! I love the free online lessons! My kids love to learn and this looks like a great resource! Thank you for the opportunity to win! I like that they have eco-friendly packaging! 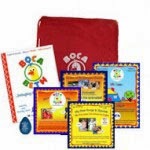 I learned that the Boca Beth program/products have been created by a teacher and translated by native Spanish-speaking early childhood experts. I learned that the company is located in Tampa, Florida.